The NEW V7 is the shining beacon of the BlackMagic range. With flash gold foil and carbon finish it is one of the best looking sticks that will grace the turf. 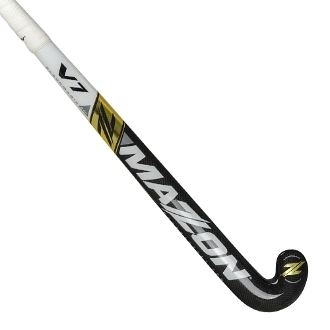 Underneath the aesthetics is a stick constructed for power and accuracy. Dual core construction with THZ protection enforcing the durability and making sure the power stays through the ball. Available in 19mm/24mm M-Bow and the new 24mm L-Bow.